Finish:Oak Shown in An elegant addition to any room. Versatile, useful and good looking. 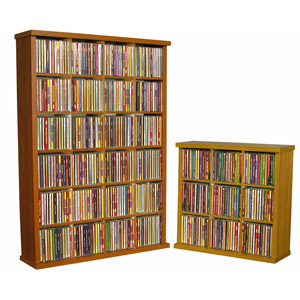 Constructed from durable, stain resistant, melamine laminated particle board Made in the USA Versatile and inexpensive Stackable SturdyStorage Capacity: 117 CDs 24 DVDs 30 Blu-ray 12 VHS Tapes 100+Audio cassettes. Also available 24 Slot Cubie.